Thule Roundtrip Snowboard Carrier , Truck & Car Racks from Proline: Thule Racks, Yakima Ski Racks, Bike Racks Canoe and Kayak Racks Cargo Carriers and Truck accessories. 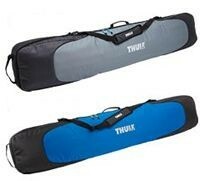 Thule Roundtrip Single snowboard carrier luggage model 205301 or 205302. Carriers one snowboard, fully padded.